Are politicians as stupid as Joe Stiglitz says? Our politicians are being stupid. Thus says the eminent US economist Joseph Stiglitz in a recent article The Politics of Economic Stupidity. In spite of its title, however, the article spends most it words explaining the economics, and actually says very little about the politics, beyond saying it is stupid in pretty much all of the developed world. He is venturing similar views to fellow US academic and Nobel Laureate Paul Krugman (who is even more vocal about stupidity) and the FT’s Martin Wolf (whose comments are more closely argued and less polemical). All three are formidable intellects. Why are they saying this? And why are their views having such little impact on those responsible for economic policy? The starting off point is the meagre rate of economic growth enjoyed by developed economies (mainly the USA, Japan, the Euro area and the UK) since the economic crash of 2007/08. The politicians cheer from the rooftops if growth occasionally reaches the rate of 3% per annum. But all economies are well below where they expected to be at this point by forecasters in 2007. Growth is meagre and living standards for the median citizen are hardly advancing at all. After a recession you should expect a rapid bounce-back, and then a resumption of steady growth of 2-3%, referred to as the “trend” rate, observed since the 1950s. The proximate cause of this slow growth is, as these economists have it, a lack of demand. In other words our economies are producing enough goods and services, but not enough people are buying them. This shouldn’t happen. Economics is a circle: what we pay people to produce things is spent by them, creating demand. Demand and supply should balance out. But this can go wrong. If people save too much, and this isn’t balanced by investment, then there can be a downward spiral, in a process brought to popular consciousness by the economist Maynard Keynes in the 1930s. This is what seems to be happening across the various world economies now. The traditional answer to this problem is for governments to stoke up demand artificially and thus stabilise things. In recent decades the consensus was that he best way of doing this is through monetary policy, usually low interest rates. This encourages people and businesses to spend more; once they spend more the system stops leaking, growth picks up and things settle back to a nice even flow. This should all be a nice self-adjusting process which does not lead to worse problems down the track. But, as Mr Stiglitz points out, this process does not seem to be working. I think he is right here, as I have blogged before, although most economists are in various states of denial about this state of affairs – so central has a particular idea of money and monetary policy become in conventional economics. That leaves a second weapon in the conventional toolkit: fiscal policy. This means that the governments deliberately spend more than they raise through taxes, creating extra demand that then plugs the gap. This has been the incessant cry of “Keynesians” ever since 2008. But this isn’t as simple as it looks. It is not self-adjusting the way that monetary policy is supposed to be. The risk is that you build a pile of government debt that cannot be repaid, causing another economic disruption down the track that undoes all your good work. Or to put it another way, it often means prolonging unproductive and unsustainable activities that will drag the economy down in due course. It is meant to be a temporary corrective, not a long-term solution. But, Mr Stiglitz and Mr Wolf say (I’m not so sure about Mr Krugman – he has become so polemical that I’ve stopped reading him), there is a way to square the circle. There is a magic bullet (they don’t actually say that). Public investment. If fiscal policy can be directed towards investment projects it will be sustainable. These projects will generate a return from which government debt can be repaid, either through direct revenues, or through higher taxes. And when government borrowing rates are as low they currently are, it doesn’t take much of a return to achieve this. And yet the developed world governments are reluctant to do this. This is what Mr Stiglitz is calling economic stupidity. But alas life is not so easy. Public sector investment is an elephant trap. Investment projects that generate their own revenues and collateral don’t need the public sector to run them. Indeed it is almost always better to let them run in the private sector, where management and accountability is sharper. And by and large all the easy ones are being done already. It leaves some big projects that turn out to be very risky – like, for example, Britain’s HS2 fast railway. And because they are risky they are slow to get up and running, and not much use as tool for temporary fiscal policy. But there is another set projects where the returns are indirect – they come from taxes in various guises. These include things like roads and bridges (given the difficulty of charging economic tolls), schools and hospitals, under Britain’s NHS. But the returns are difficult to judge and projects are selected not through a process of objective rating of financial return, but through political arm-twisting in a bid for short-term prestige. And the more urgent the need to create economic demand, the worse in quality these decisions are. Examples about. After 2008 China embarked on a massive and urgent infrastructure programme. But although the country remains underdeveloped, much of this money was wasted; whole cities have been built and lie empty. The Chinese government is now grappling with a rising tide of bad debts from the state banks that backed these projects. Japan in the 1990s invested massively in infrastructure projects; the country is littered with “bridges to nowhere” and its economic problems are as intractable as ever. In Britain in the early 2000s the country invested in a whole host of Public Private Partnerships. Many of these are turning sour because it turns out the facilities (notably in the NHS) were not actually needed. Though the political opprobrium surrounds the PPP structure, and the way that there was no real risk sharing with the private sector, we mustn’t forget the problem at the heart of it all – public sector organisations are very bad at choosing investment projects. (Actually private sector organisations aren’t any better if the accountability is weak – but that’s another story). I could go on with other examples of government expenditure that were sensible in principle but badly designed in practice (Labour’s Building Schools for the Future, for example). The upshot is that public investment is no magic bullet. It’s a good idea, and we should do more of it – but a top down blitz directed by the need to rebalance the economy in the short term is asking for trouble. Each project needs to be properly thought through and well managed. That means you can’t get them going in a hurry. So what to do? I think we need to be more realistic about the direction our economy is going. Things are changing. The demographics are adverse. The excessive wealth of an elite is economically inefficient. Modern businesses require less physical investment. Technological innovation is more about improving the quality of life than ramping up consumption. 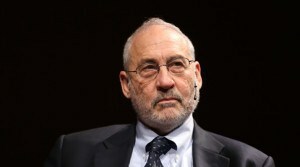 Economist such as Mr Stiglitz and Mr Wolf are well aware of these pressures. I think their time would be better spent helping us to craft long term solutions rather than ranting on about “stupidity” that turns out to be not so stupid after all. Today the eminent US economist Larry Summers writes in the FT. His subject is the US economy, but the problem he addresses affects most developed economies in some shape or form, and the British economy quite closely. Unfortunately, so many economists of his generation, an obsession with short-term macroeconomic theory means that he doesn’t seem to get the big picture. Inequality lies at the heart of our economic malaise. This debate is being conducted by academic economists in their own language, but it matters to all of us. I will summarise. Mr Summers’s starting proposition is that the US economy is suffering from “secular stagnation”. What this means is that the economy is stuck in a pattern of slow growth that does not fulfil the potential that population growth and advances in productivity should give it. This certainly seems to be true, though I think that the ability of developed economies to grow consistently at 2% per annum, the “trend rate”, must be subjected to critical analysis, rather than simply assuming it can be continued indefinitely because it has been achieved in the second half of the 2oth Century. Mr Summers then says that there are three basic ways of trying to tackle this. First is “supply side” reforms; this means trying to fix fundamental bottlenecks in the economy, such as education. Worthy though he says these ideas are, the problem with this is that it does not fix a lack of demand in the economy; there is no point in producing more if nobody buys. This line of reasoning is very much behind the Keynesian critique of austerity economics. While there is a certain logic to it, it sounds too much like saying these problems are too much effort to fix, so let’s try something else – which is a road to nowhere. It used to be that economists blamed politicians for being too short-termist; now it is the other way around. The second strategy is to loosen monetary policy. The problem is that monetary policy in the US (and the UK) is technically very loose as it is. I say technically, because in some respects monetary policy is quite tight in fact (because banks are reducing their balance sheets) – though there is little the authorities can do about it. Further loosening of policy (as advocated by the likes of Paul Krugman, for example) will simply inflate bubbles and get us back to the fix we found ourselves in 2007. He is surely right here – though I would add that I think that monetary policy is massively over-rated as a policy instrument by conventional economists anyway. The third strategy is to use government spending to keep up demand, preferably by spending on infrastructure, that will be of long term benefit to the economy. He also says that governments should try to persuade the private sector to spend more, by which he mainly seems to mean the corporate sector to invest more. The problem I have with this is its superficiality. The “secular stagnation” problem Mr Summers describes is a serious malfunction of the economic machine. This can be seen most clearly if you follow Mr Krugman’s logic. He says that the way out is to reduce interest rates to the point at which investment gets stimulated. And since interest rates are currently low, that means that we should have an effectively negative rate by stoking up inflation a bit. In other words, he is saying that the problem is that profitable investment is impossible, so we need to encourage investment that is marginally unprofitable. How on earth can an economy grow on that formula? Surely we need to spend a bit more time getting to the bottom of exactly why are in this fix, and then trying to direct public policy to fixing it. Here I follow another prominent US economist: Joseph Stiglitz (or I think I do). The culprit for lack of demand in the economy is quite clear: it is lack of investment, especially from the private sector. You can make up for this shortage of investment by running government deficits, but you are in trouble if this is more than a temporary measure. The problem is that there is systemic reason for the shortage of private sector investment, which running government deficits does nothing to fix. It is rising inequality. Big surpluses are accumulating in some parts of the economy: in the personal wealth of the very rich, and on company balance sheets. This is not being spent on investment, but being held in cash to spend later, or chasing a merry go round of assets, real estate and shares, whose overall quantity is not expanding. There are two problems here: inequality and the fact that savings are not translated into proper investments. The first of theses is the more fundamental. The Economist published an interesting article on the subject, reviewing the work of a French economist, Thomas Piketty. They point out that the inequality problem has been with us before: in the period up to 1914, giving rise to the critique of Karl Marx, amongst others. Mr Piketty thinks that developed economies are reverting to the 19th century type. The problem is slowing population growth, combined with technology that makes it easy to substitute people with machines. If he is right, the problem is not about to go away. It is the central political question of our time. So what are the answers? First of all we need to tax the rich harder. Given that so much wealth ends up in slippery multinational networks, this means international cooperation. It also means rebalancing industry and jobs so that we are less over-supplied with unskilled workers. The pressure on the finance industry, especially investment banking, needs to be maintained. All this means reversing the conventional wisdom of the Ronald Reagan and Margaret Thatcher years – but not a recreation of the failed policies that preceded them. This is an agenda of the left. It will be vigorously opposed by the right. Perhaps at long last the consensus that has ruled developed world politics will break up. But economists like Mr Summers do us no favours by concentrating on palliatives rather than solutions. Posted on August 21, 2012 Author MatthewCategories Economics & FinanceTags economics, Joseph Stiglitz, world economic crisis2 Comments on Capitalism in crisis. A smaller state and lower taxes will make things worse, not better. Is the US economy heading for a fall? Most of the worry about the world economy is being directed towards Europe, and the Eurozone in particular. I am amongst a very small group of optimists on that front – but it is easy to see why people are worried. In fact it is only through a prolonged period of crisis that Europe will find an enduring solution. But meanwhile, should we be worried about the US too? What prompted this thought was this article in Vanity Fair by the eminent economist Joseph Stiglitz (thanks to Marisha Ray for drawing my attention to this on Facebook). It’s subject is inequality, and why it is corroding the US economy, and why the elite (the top 1%) should worry. Judging by the FB comments, some readers saw this critique as applying to government thinking right across western world – the view that austerity economics is driven by an idealogical view of the role of government. But I took it as a very specific critique to the US. The very rich spend less of their income on consumption and save the rest. The more wealth that concentrates in their hands, the more consumption overall will fall as a proportion of the economy. Unless there are enough constructive channels for their savings then unemployment will result – unless alternative demand comes from somewhere. That alternative might be an investment boom (as with high tech in the late 1990s) or with big government deficits, propping up the economy now. The rich elite use their power to protect vested interests and direct their energies to what economists call “rent-seeking”: activities that enrich the individuals themselves but not the economy as a whole. Under his analysis the finance industry is largely based on rent-seeking. As energies are diverted from genuine economic growth, the economy overall weakens. What is good for the profits of existing businesses is often not good for the whole economy – which needs new businesses to come forward. The majority who are seeing their incomes stagnate, and find it more and more difficult to join the elite, get resentful, breaking down the trust that underlies all successful economies. But there is a political puzzle at the centre of this. Why is the Republican Party both veering to the right and retaining substantial popularity? Surely the welling up of resentment against the elite should translate into overwhelming political pressure for a more egalitarian system? I think the American suspicion of government is to blame. I don’t think that the majority of American people are particularly happy with the way their living standards are being held back. But, incredible as it may sound to European ears, many of them think it is “socialist” government policies that are to blame. Shrink the government, cut taxes and the 99% will start to catch up with the 1%. Of course, huge funds from the elite are available to support this view in the media – through political campaigning and biased news coverage, such as Fox News. It hardly helps that a lot Americans seem to think they can have their cake and eat it: huge expenditure on entitlement programmes (especially Medicare) without the need for increased taxes. If Professor Stiglitz is right then the US would be suffering from long term low economic growth, as the various toxic effects of its skewed income and wealth distribution gradually overwhelm the highly dynamic core economy. And indeed, measured per capita (i.e. taking into account population growth), the U.S managed annual growth of only about 1.4% in the first decade of this century (compared to the UK 1.7%, or Germany (1.9%) – though France only managed under 1% – figures from Wikipedia). Still lacklustre growth won’t cause a crash. Italy has made an art of surviving such a challenge. But the proximate cause of a crisis is clear enough – the government’s budget deficit of 7.6%, and the lack of any political consensus in how to handle it. There are three ways in which this could cause a problem. The first is if the US government should hit the Spanish problem of being unable to borrow because of a loss of market confidence. This looks implausible. Investors have too few choices where to put their surplus funds. The second is expenditure cuts sucking demand out of the US economy, causing a prolonged recession. This could happen if the Republicans take control in this year’s elections. The third is political gridlock causing government funding to seize up, and causing technical default. This looks all too possible if the Republicans control either or both houses of Congress, as looks probable. Even if Mitt Romney should gain control of the presidency (and he’s doing well on fundraising), he may well run into trouble with Congress as he desperately tries to find practical answers to the deficit problem. And what if the US survives the budget crunch in 2013? If growth continues to be lacklustre, and the top 1% continue to hog the benefits, surely US public anger will turn on the elite, as it did briefly in the last days of President Bush? I share the European view that a smaller government, reduced regulation and lower taxes will make the problem worse, not better. That will be a sight to watch from a safe distance.